Wilmot Union High School’s Haley Lamberson dribbles the ball up court against Westosha Central earlier in the season. Lamberson, a senior, scored 36 total points in two games last week, including 16 against Elkhorn (Jason Arndt/The Report). Once Wilmot Union High School found a rhythm on defense, the Panthers transition game could not be stopped on Jan. 11, when they hosted Elkhorn in a Southern Lakes Conference contest. The Panthers, who carried a 30-26 lead entering halftime, pulled away from Elkhorn in the second half to capture a 61-44 victory. Elkhorn coach Jeff Brown said his squad struggled against a quicker Wilmot squad. “I thought their quickness was our biggest problem, they got in the gaps, and when they got in the gaps, they started making shots,” he said. The Panthers’ quickness started with Haley Lamberson, who scored 14 of her 16 points in the first half, including a go-ahead 3-point play with 11 minutes, 30 seconds left. Lamberson believes the Panthers 19 total steals played a considerable role in helping them pull ahead in the second half. In the second half, Elkhorn clamped down on defense against Lamberson, holding the guard to two points. 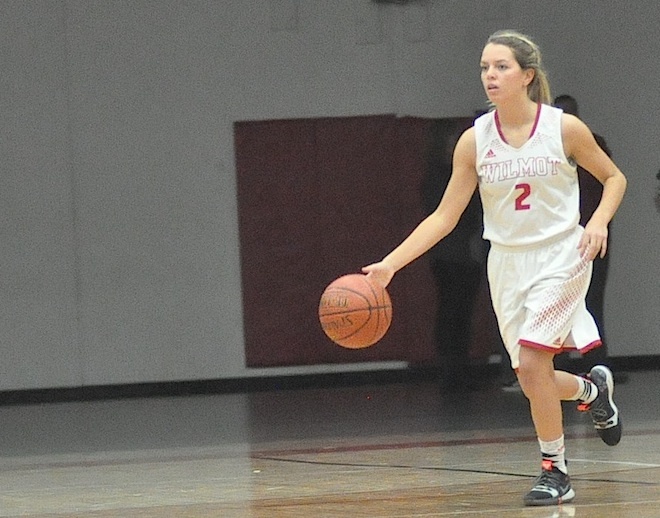 Wilmot, however, countered with senior guard Riley Alexander and senior forward Karoline Klahs. Alexander, held to six first half points, tallied 11 in the final frame to lead the team with 17 points. “I feel in the second half, we started moving the ball more and we saw the open opportunities that we weren’t taking in the first half,” said Alexander, who had five 3-pointers. Klahs, meanwhile, added another 15 points, including six from the perimeter, where she went 2-for-2. The senior trio helped the Panthers build a commanding lead midway through the second half. The Panthers, ahead 47-37, extended their advantage to 57-37 after a 10-0 run, consisting of five points from Klahs, three from Alexander and another two by Lamberson. After the Jan. 11 victory, Wilmot improved to 5-6 overall and 5-2 in the SLC. Elkhorn dropped to 9-4 overall and 3-6 in conference. Haley Remington led Elkhorn scorers with 17 points. On Jan. 12, when the Panthers hosted non conference opponent Johnsburg, Lamberson continued her shooting stretch with game-high 20 points to help Wilmot defeat Johnsburg 76-66. Junior Delaney Brown, who made nine baskets, added another 18 points for the Panthers. Julia Hickey, meanwhile, contributed from the perimeter, where she scored nine of her 11 points.